New Adirondack Property Available Close to Whiteface! Since this blog seems to be focused on skiing and how great the conditions are at Whiteface Mountain lately, I think it is a perfect time to mention a really nice, new listing we have at the Prudential Terry Horrocks Real Estate Agency, where I am an agent. The property is located in the village of Upper Jay, which is only six miles from the mountain. It is a brand new construction, with beautiful panoramic views of the star of our blog, Whiteface Mountain. "Adirondack-style home with panoramic views of Whiteface Mt., the Sentinel Range and Ebenezer Mt. this home is situated on a private three-acre lot just six miles to Whiteface Mountain Ski Area and 20 minutes to Lake Placid. The 2,200 sq. ft. floor plan with state-of-the-art structural components is energy efficient and has a propane-fired, hot-water/radiant heating system. An additional 1,300 sq. ft. of walk-out lower-level living area can be finished to suit your needs. The main level features an open Great Room with a high cathedral ceiling and a river-rock gas fireplace with a pine slab mantle. Maple hardwood flooring in the main living areas, high quality Berber carpeting in the bedrooms and ceramic tile in the foyer and bathrooms make this a very special offering. The house is very bright with lots of windows and patio doors leading to an expansive front deck. The kitchen features hickory cabinets, stone counters and high-end appliances. The master bedroom and bath are on main level, with two bedrooms and a full bath on the upper level. Above the garage is a "bonus room" for conversion to a studio or workshop. All this and available for immediate occupancy!" Please drop me an email if you'd like to take a look - we can check it out on our way to Whiteface! According to a reliable source (TSSREBIK), skiing is fantastic at Whiteface. "Only more fresh snow could make it any better and the summit chairlift opened." Naturally, more fresh snow is in the forecast for the next two days! The Christmas Blizzard of 2007 dumped nearly two feet of snow at Whiteface, and Skyward, one of the most wonderful ski trails in the east, is set to open this weekend. 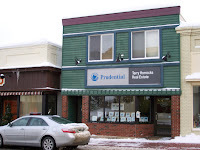 Today's picture is a shot of our Lake Placid office at the Prudential Terry Horrocks Real Estate Agency on Main Street.